Ahoy there! 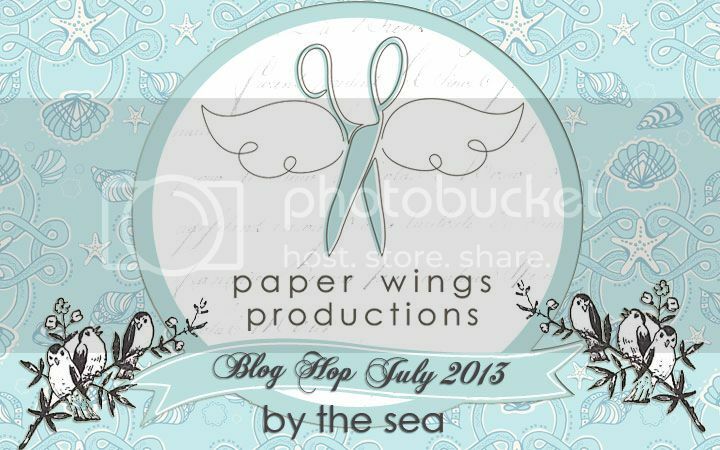 Welcome to the “By The Sea” Paper Wing Productions' Design Team Blog Hop and Giveaway. If you've arrived here from Dana's blog, then you're in the right place. 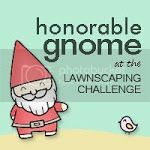 If you’re just stopping by for a visit, I’d love for you to check out our hop...you will love what you find. Please CLICK HERE to start from the beginning. This month we’re sharing enchanting projects from down “by the sea”. So grab a tall cold drink with a colorful umbrella naturally and let’s go “by the sea.” There will be blog candy along the way too so make sure you stop by each blog! 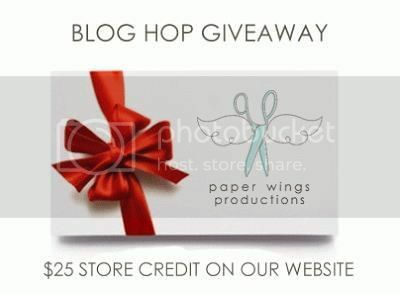 This month’s main prize is a gift certificate to the new Paper Wings Productions' online store. 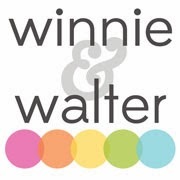 The winner will be announced on Tuesday, July 9, 2013 on The Aviary. Are you ready to see what I have in store for you by the sea? 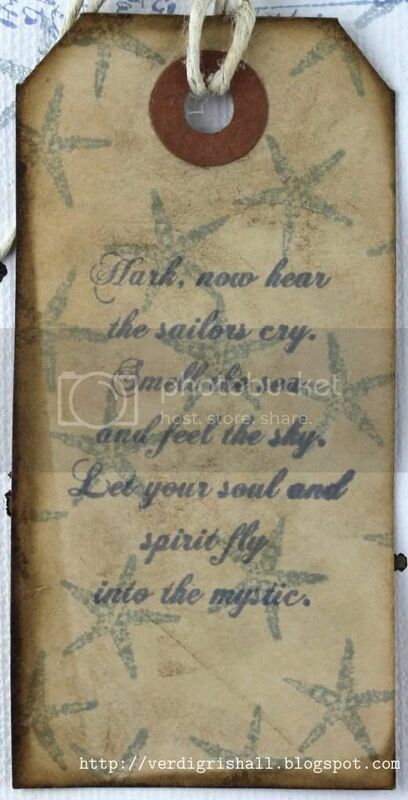 It just so happens that I am in a nautical mood and luckily Paper Wings Productions has just the stamps I need to make a nautical inspired canvas panel. I began the canvas by stamping the waves from Mermaid on the bottom right hand side of the canvas with grey ink. Then I over stamped the postcard in blue ink from Writing Backgrounds or Postcard. 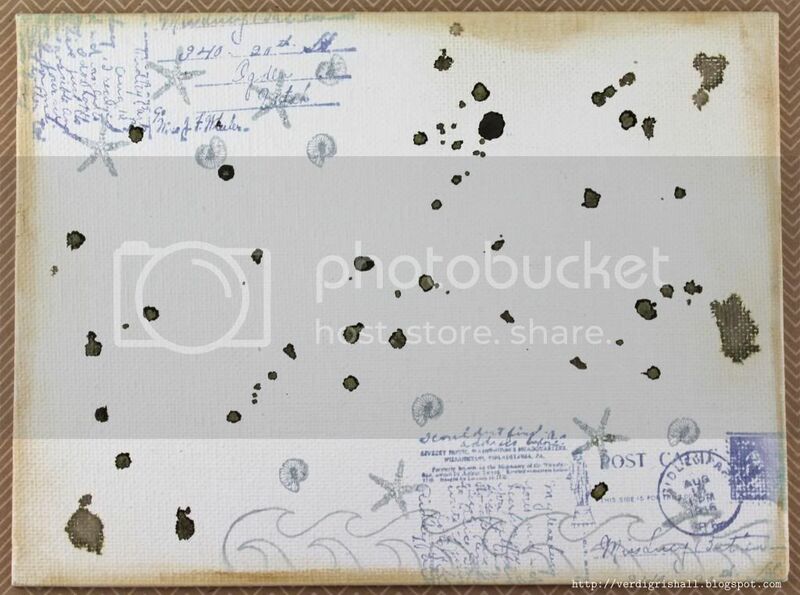 I also stamped the postcard on the top left of the canvas. The last bit of stamping on the canvas was to add several shells and starfish from Sea Melange or Sea. Lastly, I added some drops of mist and distressed the edges with Distress Ink. I stamped the starfish from Sea Melange or Sea in grey on to a coffee stained tag. The quote from Sea Melange or Seaside was stamped in blue ink. 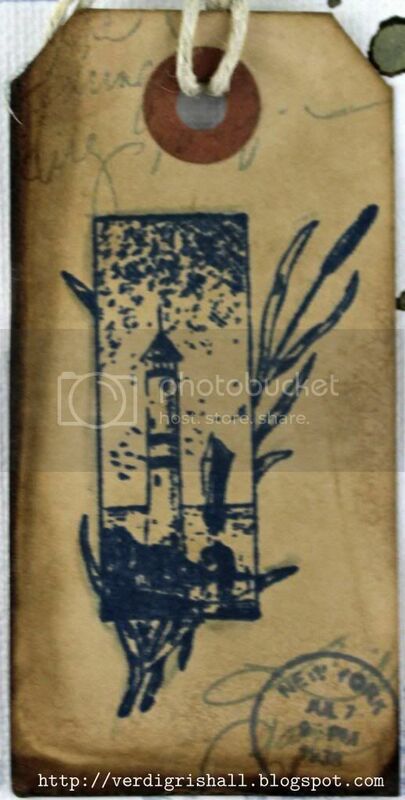 The lighthouse from Sea Melange or Seaside was stamped in navy on a coffee stained tag. I added some depth to the image by using a Copic marker. In blue ink I stamped the cancellation seal from Text Melange or Text on the bottom right. I stamped part of the handwriting from Writing Backgrounds or Writing in grey over the seal and on the top left of the tag. 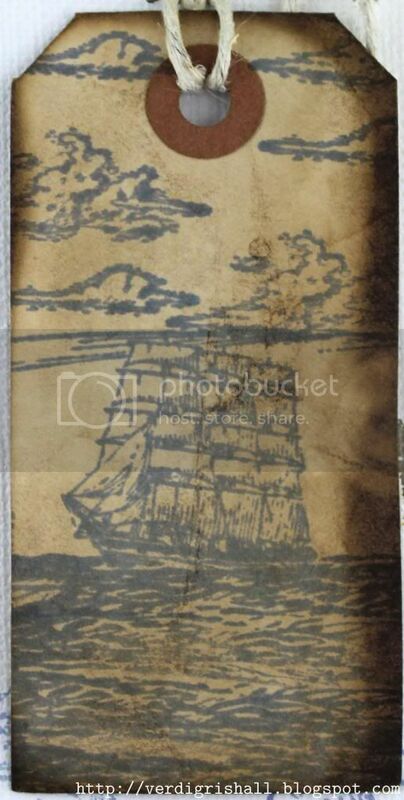 I stamped the ship scene from Sea Melange or Sea in blue on a coffee stained tag. I stamped just the waves a few more times to fill in the bottom of the tag which turned out perfect! I stamped the clouds from Earth & Sky Melange or Cloudy several times on the top of the tag in blue ink to finish off my scene. I think this little baby is going to my papa as he also loves the nautical look. I love when something I make can be given as a gift. Win-win. By the way if you want to see a couple of other by the sea projects I've made in the past for Paper Wings Productions click HERE (mermaid) and HERE (boat). Make sure to also visit The Aviary for lots of other fabulous by the sea inspiration and much, much more! That's it from me for now. Make sure to head on over to finish up the hop at The Aviary. It has been an absolute delight to have you visit me today and I hope this hop motivates you to ink up some Paper Wings Productions stamps! This is beautiful!! I love the stamps you used!! The tags look amazing!! Awesome piece! I LOVE how you mixed the Writings Backgrounds set with the Sea Melange set for your background! Nice job with the tags as well! I love the aged look. Thanks for the inspiration Shay! I luv the nautical look, too! Your canvas turned out great! I love the detailed stamping on the canvas and the tags. The combination is "sea-worthy" of any ship's captain! Sorry, I got off on a tear. . . . Thanks for your inspiring piece, Shay! P.S. I also love your new blog design. Beautiful canvas! I especially love the background. Your papa will enjoy this so much! Love the lighthouse stamp! Your canvas is beautiful! Shay, I love the simple muted colors on your canvas. What a wonderful gift for your Dad. 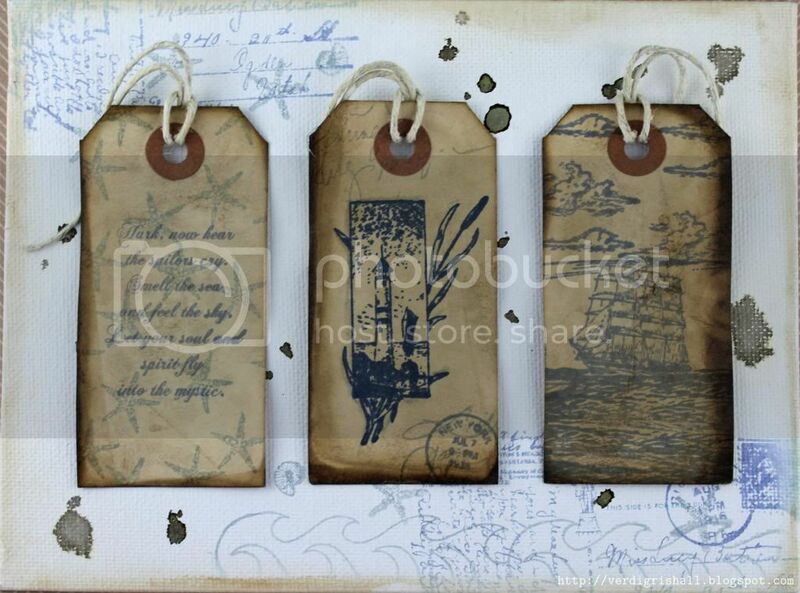 Absolutely gorgeous canvas, love your tags and your stamping! I love your project and how you created a vintage looking piece! 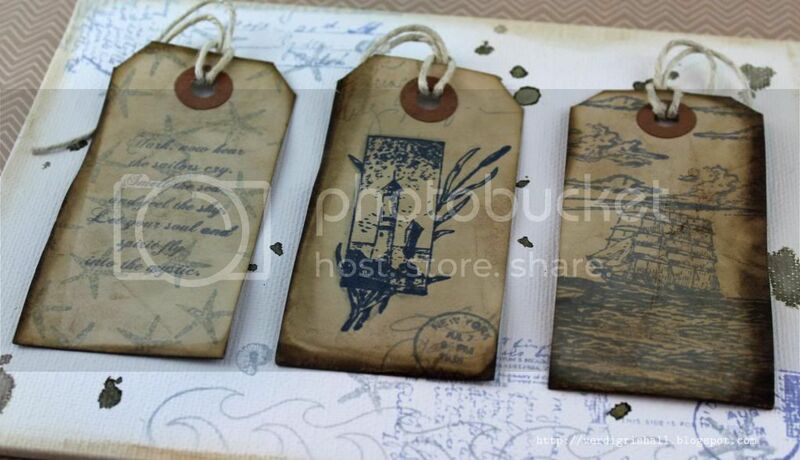 Gorgeous tags, I just love the vintage look of them! Gorgeous piece! Never thought about putting tags on canvas like that. what a gorgeous canvas! Love the background you created!